ORDINARY MOMMY DESIGN: Organizing :: Headbands and Necklaces. Organizing :: Headbands and Necklaces. I was mulling over the fact that I had too many largish necklaces and a handful of headbands that didn't have a good place to live. I wanted to find a simple solution where they would be out of my way, but wouldn't get smashed and tangled. These inexpensive robe hooks from Target did the trick. Plus my walls are a little bit happier too. 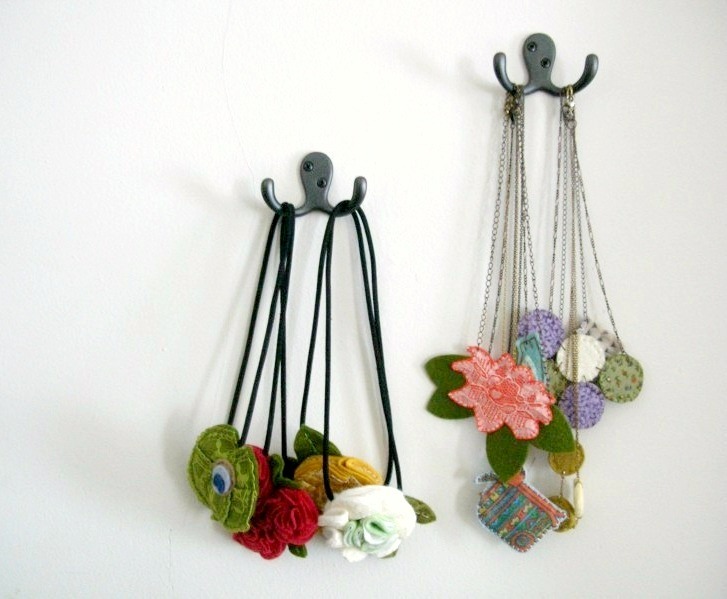 I have a pretty iron hanger with 4 hooks on it that I use for my necklaces & headbands, too! It totally does make the wall prettier! This is a really clever, pretty idea. I love the mix of iron and felt. I also did these months ago and put 5 hooks to my girl’s room so they would have initiative and know-how in organizing their own hair accessories and necklaces while they are young. Great stuff! Your headbands are adorable! Especially the flower ones, they look so fashionable.